One of the really elegant parts of Lightning Components was the ability to conditionally apply classes based on data. A getter, that accepts no parameters. As seems to be increasingly the case, as soon as I posted this I was corrected on a couple of points. I've since updated the post to include that feedback. Hopefully the result isn't too confusing! Let’s say we want to render a list of objects. There’s a flag 'isSelected' on each of the records, and if that flag is set we want to change the rendering for that particular record. In a Lightning Component, this would be near trivial, as we could use a ternary operator in the template to render the inclusion of the 'selected' class conditionally. The reason this is so simple, is that we could put proper expressions into our replacements in Lightning Components, giving us fantastic flexibility in the output for each individual attribute. First up, let's just clarify what we mean when we say we can no longer do the string concatenation, or the ternary operator in an attribute expression, as I detailed in my earlier post. OK - so what other options do we have? We need to process the data after we’ve built it. This means we can no longer use a wired property, and need to use either a wired function or imperatively called Apex. This may not be a big deal, but it's worth noting. Data retrieved from Apex is immutable, so if this is the only thing we need to add to the data, then may find that we need to copy data into new objects, or add a new data structure in order to get the classes property added - that can be a pain. Option 2 - Use a template 'if' and repeat the li tag. We're breaking the "Don't repeat yourself" (DRY) principle, and repeating the structure of the <li> tag in each side of the IF condition. In this simple case this may not seem like a big deal, but still - any change to that rendering now needs to be made in 2 places, instead of 1. And let's be honest, how often is the case this simple? We'll probably find that we have to copy a LOT of the template to work like this. Option 3 - Use a template 'if', and change our CSS. Another alternative is to use the template if, but to isolate the part that changes from the part that doesn't. That is, we introduce HTML inside our 'if:true' that only exists in order to apply the formatting that should be assigned to the 'isSelected' records. That is, we do the following in our template, to introduce a new, standalone, div that has the 'selected' class applied, and then wrap the content of the <li> in another div. Having done this, we can use more advanced CSS selectors to apply our 'selected' style to the div that follows the div with 'selected' as its class. The selector '.selected+div' means 'The div that follows the tag with the class 'selected'. You can read about CSS Selectors here. We conditionally render only the addition of the class in the template - nothing is repeated. Option 4 - Introduce a sub component. It would be good if we could call a getter function at run time in order to get the list of classes, along the lines of the component described in the earlier post. The problem is that we can't call a function and pass it the context of the individual record that we are rendering. So does that mean we can't call a function? No, it just means that we need to narrow the context of the component down into each record before we call the function - and we can do that with a sub-component that just renders the <li>. Both the template for the parent and sub component are very simple and focused on small aspects of the rendering - no IFs in the templates is a good thing IMO. It's very possible that there will be more complex behaviour required in the future, and having the context set to be the individual record could make that behaviour much simpler to implement in the future. For example, passing data into events due to a 'click' event could be well served if we have that distinction between the parent and child components and context. Update - 28/12/2018 - Unfortunately though, in this case, we generated non-valid HTML. Since we have introduced a new component, we have also introduced a new tag into our generated HTML. The result is something along the lines of ul -> c-record-renderer -> li, and this is not strictly valid. We should certainly bear this in mind when looking at individual situations. The conclusions were re-written after the feedback that you can find in the comments below, and some more thought on the topic. The limitations of the expressions allowed in templates makes for a less elegant solution to this kind of problem. However, that's not an altogether terrible thing. Sometimes you can have too much power and too many choices. Limitations can allow us to define recognised best-practices that are harder to break away from. So which way should we go? Well, that depends on the precise scenario, and in this case we have defined something precise, but potentially a little too simplistic to define a clear best-practice. I would find it hard to argue that Option 2 (repetition in the template) is ever worth the pain - repeating chunks of template or code is rarely a good idea, even in the simplest of cases. Option 1 (pre-process the data) has its merits, and as Caridy has responded below, is the recommended approach from Salesforce - that's not to be sniffed at. However, if the only reason you would be processing the data is to add a list of classes to it, I'd suggest that it shouldn't be your immediate 'go-to' solution. My initial reaction to Option 3 (advanced CSS selectors) was that it was a decent one with few drawbacks, although the more I look at it, the more I dislike the fact that we are breaking the semantics of the HTML document we are generating. We introduce structure who's only purpose is to define the rendering behaviour of another component. That's not really how HTML is supposed to work. Ideally we have meaning in our structure, and this structure expresses no meaning. So, even though Option 3 may often be straightforward, I'd probably shy away from it now. Just because CSS selectors can be used in this way, doesn't mean that they should. Option 4 (decompose the component) doesn't really work in this case - it generates non-valid HTML. But that doesn't mean it never works. There will be plenty of similar scenarios where the resulting HTML is perfectly valid. In fact, I'm sure we'll often find scenarios where the sub-component we produce will be a re-usable component that we can drop into other scenarios easily. In that situation we'll surely want to decompose instead? Simply put - there's no clear answer, as is generally the case - the technique we use should be appropriate for the scenario we're implementing - though options 2 and 3 will rarely be appropriate.. If there are other good reasons to split some of the rendering into a sub-component, then splitting it out is probably a good idea - but if that results in non-valid HTML, then it's a bad idea. If there are other reasons to pre-process and re-shape the data, then adding the class definition to that processing is probably a good idea - but if it forces you to clone records and re-shape them just to add a class, then maybe it's not the best idea. I definitely take the point from Salesforce that the latter is their preferred route, but my natural instinct is pretty much always to reduce processing and make smaller things. It'll be interesting to see how much my opinion changes as I build real applications with Lightning Web Components. Based on how much my opinion has changed in the last 24 hours - I expect it to change a lot! Thanks to an anonymous comments poster from inside Salesforce, I've come to learn that this post contained some inaccuracies - a typo in some code, a forgotten parameter to 'bind' that made an example more complex than it needed to be, and a lack of experience with Shadow DOMs that led to a failure in event propagation. I'm massively grateful to the poster for pointing out my errors, and helping to learn a little more about the capabilities. I've left the original text intact and annotated where appropriate, to correct my errors - except the typo in the example - I've fixed that. Another fantastic inclusion in Lightning Web Components is the completely reworked events model. De-composing functionality and building smaller, and more generic building blocks has become much simpler and much more intuitive. In the world of Lightning Components I never got on with events. 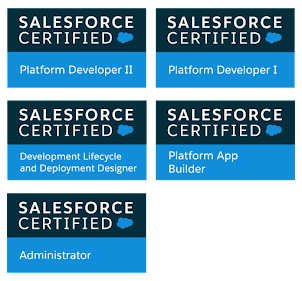 The idea of adding a Salesforce configuration for an event, registering events on the dispatcher template, and then registering listeners on the receiving template seemed really cumbersome. And then added onto that was the differences in syntax between component and application events. They just felt really unnatural. We've already seen how we can use @api allow state to be passed into our components. Now we're talking about notifying our parents when events occur. I could go into deep detail on how this is done, but the documentation on this area is spot on, and there's no need to repeat it - follow the guide in the docs and you can't go far wrong. It's particularly well written and introduces the concept brilliantly. That said, there has to be something to say, right? In the child component, we create and dispatch an event. When you include the child component, you specify the handler for the event in the template. The event should not start with 'on', and the attribute you assign the handler to will have 'on' appended to the start. The fact we can specify the handler as 'onvaluechanged' when we create the tag is LWC specific, and for very good reason (explained later). You cannot do this with standard Web Components. We can pass data from the child component in the event, by passing an object as the second parameter. Note that the data can only be in the 'detail' property. If you add data to any other property you may accidentally overwrite a standard property, and if you don't use another standard property it won't be visible in the event anyway - you put data into 'detail', and that's all you have. Live with it. You can pass an object, but if you do you should construct it there and then. But you probably shouldn't. OK, that's all well and good - but where are the limitations? Well, the main one I've found was a real surprise to me - to the point that I'm worried that I've misunderstood something. I did misunderstand something, so the next few statements are wrong. This isn't a limitation of LWC, nor even a Salesforce specific behaviour - this was me not understanding the shadow DOM model, and missing a vital piece of documentation. I've left it here for completion's sake only. When the value of the input changes, the onchange event is handled by both the onchange handler on the input and the 'grandparent' div. Events propagate through the whole DOM, unless a handler stops it by calling 'stopPropogation' against the event. It's generally recognised that this is a good thing, and that events should not be stopped unless there's very good reason. However, as far as I can see, this is not true when you cross boundaries between LWCs. (Update 22/12/2018 - it IS true, but different, and explained later). Assuming that the parent component does not raise a 'valuechanged' event of its own, the 'onvaluechanged' handler on the grandparent component will never get called. Note: these are actually slightly different scenarios I'm explaining, but I think it's worthwhile in order to illustrate the point. Also, there is a 'bubbles' property that you can set on the CustomEvent when you create it, although I didn't see a change in behaviour when I did that. As I've said, I'm surprised by this behaviour, so am happy to be told I'm wrong, and learn where my mistake is. And it turns out, I HAVE been told where my mistake was, and so the following section has now been added. In essence, what we have to do is define the event as one that both 'bubbles' and is 'composed'. The former means that it will travel upwards through the DOM, a resulting effect being that multiple event sources can be handled by the same handler. The latter means that it will cross the boundary between the Shadow DOM (the component that raised it), and into the next (the component that included the one that raised it), and then keep going all the way to the document root. This is all very well explained in the documentation, and so you should read it carefully to understand it. Bubbling and Composed Events are extremely powerful elements, and allow you to perform some complex event management and (for example) react in many different ways to the same single event being fired. However, with that power comes great responsibility. The more 'global' in nature your events are, the harder they are to debug and the more care you need to take in naming them. I think I'm with Salesforce on this one - decompose your components and keep your events as local as possible. So what of the 'on' behaviour? Why is this such a cool addition? Well, that's best explained by illustrating what we would need to do if this wasn't available to us. It dispatches a 'valuechanged' event that we can handle in a parent component. Note we are no longer setting onvaluechanged because, in our hypothetical scenario, this is not possible. You can see the docs for those functions here. We can't use the constructor, as the component hasn't been added to the DOM yet. We can't use the connectedCallback, as the component's children haven't been rendered yet. We can use the renderedCallback, but this gets called multiple times - whenever any reactive properties change, so we need to protect against multiple adds. In the following section I missed an important parameter that could be passed into the 'bind' onto the event listener registration. This led to a slightly convoluted solution using fat arrows. I'm leaving that text here, as I think it's an interesting aside, although at the end I'll present a simpler solution. That is a bit clunky, but it looks like it should work. We 'bind' the 'handleOnValueChanged' function to the event listener. Basically, 'this' isn’t guaranteed to be what you think it is. If you write code that behaves in a procedural way, then it will generally be the object in which the method is defined. But as soon as you add in callbacks, Promises and asynchronous behaviour, it isn't guaranteed to be. In our particular case, you could use an alternative - the fat arrow notation for defining functions. In the end, this would work. But no-one would suggest it was elegant. And in order to get it working we had to brush up against some advanced behaviour of 'this'. Now, I admit that people are going to have to learn how 'this' and its binding behaves in order to write reliable Lightning Web Components - but just to add an event handler? A simpler solution than a fat arrow, would be to use 'bind' for the purpose it was designed and pass in the context into the call. I.E. to do the following. This has the same effect as the fat-arrow function, in that is ensures that when 'handleOnValueChanged' is executed, it is done so with the context of 'this' being that of the component's object. The reality is that we don't have to think about it - Salesforce have given us a very usable shorthand for it, and we should be extremely grateful for it! Lightning Web Components - Unit Testing immediate impression. One of the things I’m most excited about in Lightning Web Components is the ability to write Unit Tests for the components. The example ‘getRecord.json’ file isn’t valid JSON. In order for the file to work, the field names need to be surrounded in double quotes. Interrogating the ‘element’ for its state does not seem to work. Instead, I found that I needed to get data from the document object. // Resolve a promise to wait for a rerender of the new content. I didn't see a reference to this being missing, though I guess I may have just missed that, and I know that the recommendation is to use LDS whenever you can. I just worry that there's a really important use case out there - it seems natural to me that components that use custom Apex are likely to be more complex than ones that use LDS. And with that in mind, it feels like missing Apex will be a big loss to the testing framework. Hopefully the last part is already known about, is a bit of missing documentation, or is simply that I misunderstood something. Whatever the case, I plan on doing more investigations into the Unit Testing capabilities, and will obviously blog my findings - but I have to admit that I found the initial experience a little disappointing after the extremely polished experience up to now. I sincerely hope that it isn’t an indicator that Unit Testing is bit of an after-thought. When I couple that with the fact that the git repo for the ebikes app seems to only contain one set of tests for the productFilter component, I'm stating to take the hint that unit testing hasn't been explored by the team fully yet. I've blogged about a few of the behaviours of Lightning Web Components, but the proof is really in building useful bits. What happens when you actually try to make a re-usable component? For our example, we'll rebuild 'ui:message'. A now (seemingly) defunct base component that would render a message in a box that is coloured based on the 'severity' of the message being shown. In the original it could be set to 'closable', although we're going to ignore that and focus on just the rendering of it. Looks pretty straightforward, and actually - it is. Just as long as we know about a few simple concepts. OK then, let's pick a few of these bits apart, and hopefully we'll explain a few little behaviours along the way. First up, let's take a look at the '@api' declarations. To expose a public property, decorate it with @api. Public properties define the API for a component. An owner component that uses the component in its markup can access the component’s public properties. Public properties are reactive. If the value of a reactive property changes, the component’s template rerenders any content that references the property. Why would a public property be reactive? Put simply, if we change the value of one of those properties in a parent component, we want the component to re-render - and it's pretty much guaranteed that we ALWAYS want the component to re-render. So that takes care of the attributes we need to pass in, what about the content? Lightning Components had facets. And they weren't intuitive. I mean they weren't complex, but they weren't in keeping with HTML - they always felt unnatural - especially in the simplest of cases. Lightning Web Components fixes that, with slots. And in the simple case they are trivial. The documentation isn't long, and doesn't need to be. All we need to do, in this simple case, is add <slot></slot> into our component, and the body of any tag that instantiates the component will be rendered in that slot. Now something that's missing from the documentation, which is a fairly obvious behaviour once you see it in action, is that slots are effectively reactive. That is, if you change the content of the tag, that content is immediately reflected in the component's rendered output. Whenever the value of 'errorMessages' changes, the slot inside the 'message' component is re-rendered to include the new content. The use of the getter illustrates an important difference between the behaviour of the templates in Lightning Components (LC) and Lightning Web Components (LWC), as well a reminder of the behaviour of properties. In LC, our replacements could include expressions, so we could build up strings in the template. In LWC, we can't do this, we can only reference properties or getters. Not only that, but we can't build up the strings in the attribute assignment. In LWC we don't assign properties to attributes in this way, the framework takes care of the wrapping in double quotes, escaping the strings, and other such things, so we can only assign the property, and that's it. So, if we want to assign more than just the value of 'severity' to the class attribute, we need to build that string up outside of the template. Your first reaction might be - OK, we can create a trackable property to store it, right? But this doesn't work. You'll end up with the classes property defined as 'undefined uiMessage', and it won't change. Why is that? Now, when the 'severity' property changes, the 'classes' property is re-injected. In order to get the value for 'classes', the getter is executed - this is the only way the property can be retrieved. In doing so, the string concatenation is re-evaluated and the new value is retrieved. None of the concepts here are particularly difficult, or really that earth shattering, but building even the simplest of re-usable components starts to shed some light on what the parts do any why. Following on from yesterday's investigations into the behaviour of '@track', and its effect on untracked properties, I figured I should expand my remit to '@wire'. In the wire adapter’s configuration object, prefix a property with $ to reference a property of the component instance. The $ prefix tells the wire service to treat it as a property of the class and evaluate it as this.propertyName. The property is reactive. If the property’s value changes, new data is provisioned and the component rerenders. The bit that really piqued my interest was 'The property is reactive'. That's the case in the above example - the property passed as a parameter 'recordId' as referenced by '$recordId' is defined as an api field, and is therefore tracked. So, what is the actual behaviour in this case? Are the implications the same? You can code that illustrates the below examples, as well as the points from yesterday's post in this bitbucket repository if you want to explore the behaviours further. I suggest you take a look. The searchString's change causes the wired function to be re-evaluated. Therefore the value of 'contacts' changes. The component treats contacts as if it was tracked and causes the component to be re-rendered. OK. That's pretty decent, and what the documentation says will happen. No surprises there! But then I got to thinking: So, what happens if the property isn't tracked? Looking at what's actually going on, that does make sense. It's the '$searchString' reference that tells the framework that searchString is reactive, as respect to the wiring, so it's that causing the Apex to re-execute. And once the method is re-evaluated, the value of 'contacts' changes, and that causes the component to re-render. That got me to thinking - so what does the '@track' do against the searchString in the original example. Experience tells me that these things generally will have an effect. This hooks into the component's lifecycle, as described here, and will tell us when the component gets re-rendered. It turns out that my initial understanding of the first example was slightly wrong, though not in a way that would generally have much of an impact. The component to be re-rendered (since it is tracked). The wired function to be re-evaluated (since it is referenced as a '$' parameter). The execution of the wired function causes the value of 'contacts' to change. The result is that the component is re-rendered twice! And sure enough, if you take the tracking off the searchString parameter, the component is only re-rendered once. Don’t overuse @track. Track a property only if you need the component to rerender when the property’s value changes. Personally, I think I'd call out this particular behaviour and remind people - you don't need to 'track' a property in order for the wired method to re-execute - but maybe it's just my lack of attention that missed that little point. And I'd also state that you should only track a property that is being used as a reactive wired parameter if you need the property to be re-rendered before the Apex you are calling returns with its result.